Games: Pokies (classic slots, video pokies, progressive jackpot pokies), blackjack, roulette, video poker, keno, scratchies, baccarat, and live dealer games. Note: As of 2017, Thrills is no longer available to Australian players. The information provided in this review is intended for an international audience only. First deposit – get a 200% matched deposit bonus for any deposit over $20, with a maximum bonus of $100 available. You’ll also receive 20 free Super Spins to use on Starburst, which is a free spin valued at $1.00 per spin so it brings some pretty good winning potential. These free spins are credited to your account in installments of five spins per day during your first four days of memberships. Second deposit – claim a 50% matched deposit bonus up to $100. Third deposit – claim a 50% matched deposit bonus up to $100. Fourth deposit – receive a 100% matched deposit bonus up to $100. All up you get $400 in free bonus money you can take advantage of when registering at Thrills, plus anything you manage to win from those lucrative free Super Spins. Just make sure to tick the “I want a bonus” box when making your deposit. Thrills is all about quality over quantity. This venue doesn’t offer one-off promotions as regularly at some of our other recommended casinos, but when it does, the rewards are on the larger scale and the promo period usually lasts for longer. Given the hefty nature of these bonuses, it will be well worth your while to sign up for an account at Thrills to stay in the loop of any new bonus offers which become available. 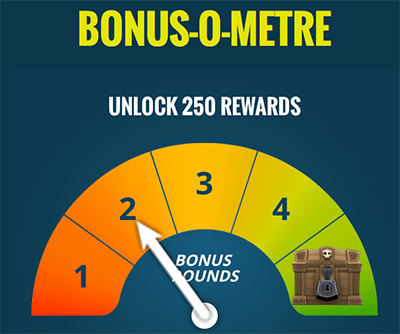 Registered players also benefit from the ongoing Bonus-O-Meter promotion. Thrills Bonus-O-Meter – the Bonus-O-Meter rewards players for playing specified pokies games, with hidden treasure lying in NRVNA, Hooks Heroes, Flowers, Dracula, Gonzo’s Quest, Ghost Pirates, Neon Staxx and Wild Rockets. Every time you play one of these games for real money and trigger one of the bonus rounds within the game, you’ll unlock treasures and move up higher on the bonus meter. Once you’ve filled the meter and unlocked a treasure chest, you’ll be rewarded with up to 250 free spins. Only real money bets of $0.40 or higher made on the desktop versions of these specified games apply. $45K Seek the Thrill Giveaway – to celebrate its recent facelift, Thrills offered 10 days of huge casino giveaways, with a prize pool of $45,000 available for registered players. Prizes were granted in the form of cash and free spins, with daily free spins and a huge Grand Raffle prize up for grabs. The winner of the Grand Raffle prize was instantly $5,000 richer. 67 Days of Casino Giveaways – in 2015, this huge ongoing promo offered players the chance to win free spins, cash and casino credits every day of the summer. A new prize was available to claim every day if you played at Thrills a certain number of days in a row. This is also where the Bonus-O-Meter first came into play and was so popular it became a full time fixture. Thrills is one of our only recommended casinos which doesn’t offer a loyalty rewards program for regular players. Instead, the Bonus-O-Meter acts as an ongoing way for players to scoop up free spins and casino credits. The downside is this only benefits pokies players, so if table games like blackjack and roulette are more your thing and you’re wanting to earn loyalty points for your real money play, you might want to look elsewhere. The wagering requirements attached to Thrill’s welcome bonuses differ, which can be a bit confusing so make sure you know which one applies to which deposit. The first and fourth deposit must be played through 30 times before you can cash any winnings made from the bonus money, while the second deposit must be played-through 20 times before winnings can be withdrawn. Any winnings made from welcome bonuses will be forfeited if the wagering requirements are not met within 30 days. Like any other casino bonus, always read the fine print in the terms and conditions of a bonus offer before making your deposit so you know exactly what your wagering requirements are and will avoid any future disappointments. While Thrills always has an enticing welcome bonus up for grabs, the site has confused us lately with its inconsistency. In just a couple of months we’ve seen the welcome bonus change more frequently than we can keep up with, which we assume this was a result of the mid-2016 site makeover throwing some spanners in the works. Now the site update is complete, we hope the welcome bonus will remain a little more consistent, but we’ll keep checking back to make sure the information provided on our page is up to date. Thrills offers a premium mobile casino, with hundreds of instant-play games available on the go. Its browser based nature means games are available over a majority of all smartphone and tablet makes and models, including iPhone, iPad, Samsung Galaxy, BlackBerry, Windows Phone and other devices running on the Android operating system. While all the standard welcome bonuses are available for mobile players, there are no bonus offers available specifically to mobile users, with the same deals available for both desktop and mobile use. Note: pokies played using mobile are not eligible to go towards the Bonus-O-Meter progress. What casino games are available at Thrills? Thrills has more than 700 real money games from 13 of the best online software developers, including NetEnt, Microgaming, BetSoft, Quickspin and Yggdrasil. All games are available in instant-play mode directly over your Web browser, with no downloads required. We’ve outlined some of the hottest titles at Thrills below. Pokies: Starburst, Gonzo’s Quest, Hall of Gods, Guns N’ Roses, The Wild Chase, Jimi Hendrix, Seasons, Gemix, Mega Fortune, Mega Moolah, The Glam Life, Nirvana, Jack Hammer, Bar Bar Black Sheep. Video poker: All American, Aces & Faces, All Aces, Bonus Poker Deluxe, Deuces Wild Poker, Jacks or Better, Deuces Wild. Live dealer: Live Blackjack, Live Casino Hold’em, Live Blackjack Party, Live Blackjack Fortune VIP, Live Auto Roulette, Live European Roulette, Live Blackjack Diamond VIP, Live Blackjack Platinum VIP.